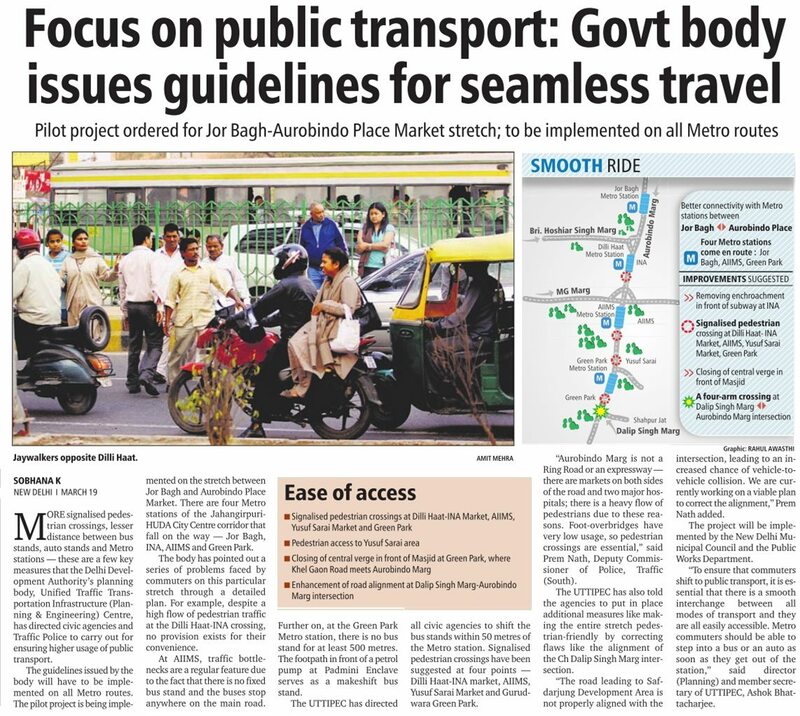 Pilot project ordered for Jor Bagh-Aurobindo Place Market stretch; to be implemented on all Metro routes. More signlised pedestrian crossings, lesser distance between bus stands, auto stands and Metro stations — these are a few key measures that the Delhi Development Authority’s planning body, Unified Traffic Transportation Infrastructure (Planning & Engineering) Centre, has directed civic agencies and Traffic Police to carry out for ensuring higher usage of public transport. The guidelines issued by the body will have to be implemented on all Metro routes. 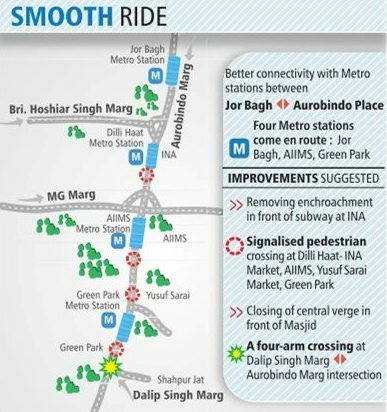 The pilot project is being implemented on the stretch between Jor Bagh and Aurobindo Place Market. There are four Metro stations of the Jahangirpuri-HUDA City Centre corridor that fall on the way — Jor Bagh, INA, AIIMS and Green Park. 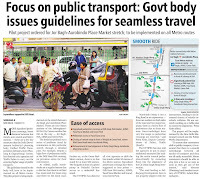 The body has pointed out a series of problems faced by commuters on this particular stretch through a detailed plan. 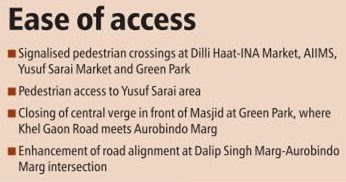 For example, despite a high flow of pedestrian traffic at the Dilli Haat-INA crossing, no provision exists for their convenience. At AIIMS, traffic bottlenecks are a regular feature due to the fact that there is no fixed bus stand and the buses stop anywhere on the main road. Further on, at the Green Park Metro station, there is no bus stand for at least 500 metres. The footpath in front of a petrol pump at Padmini Enclave serves as a makeshift bus stand. The UTTIPEC has directed all civic agencies to shift the bus stands within 50 metres of the Metro station. Signalised pedestrian crossings have been suggested at four points — Dilli Haat-INA market, AIIMS, Yusuf Sarai Market and Gurudwara Green Park. “Aurobindo Marg is not a Ring Road or an expressway — there are markets on both sides of the road and two major hospitals; there is a heavy flow of pedestrians due to these reasons. Foot-overbridges have very low usage, so pedestrian crossings are essential,” said Prem Nath, Deputy Commissioner of Police, Traffic (South). The UTTIPEC has also told the agencies to put in place additional measures like making the entire stretch pedestrian-friendly by correcting flaws like the alignment of the Ch Dalip Singh Marg intersection. 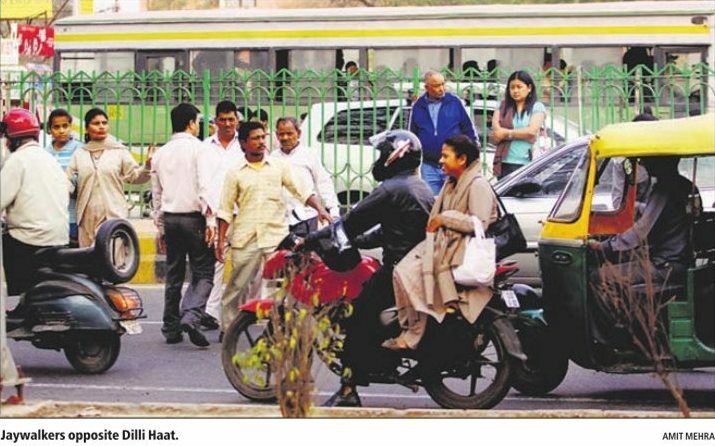 “The road leading to Safdarjung Development Area is not properly aligned with the intersection, leading to an increased chance of vehicle-to-vehicle collision. We are currently working on a viable plan to correct the alignment,” Prem Nath added. The project will be implemented by the New Delhi Municipal Council and the Public Works Department. “To ensure that commuters shift to public transport, it is essential that there is a smooth interchange between all modes of transport and they are all easily accessible. Metro commuters should be able to step into a bus or an auto as soon as they get out of the station,” said director (Planning) and member secretary of UTTIPEC, Ashok Bhattacharjee.